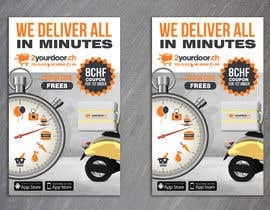 We are a delivery platform delivering from all retail stores in the city under 1 hour. I need a flyer design. Portrait A5 size. In this flyer we want to emphasize the variable items we can deliver ie. food, grocery, flower, electronics, toys , your key or passport. I am attaching a poster from a service doing the same thing like us to be inspired. Key message: "We deliver all in minutes" at the top. I am also attaching our logo to be used. We need Android and IOS store logos. please contact me i will doing this design..
pls check entry #117. Thank you! Please Check my entry #95 & update your comments. Thanks. where is your attaching poster ? Hello Friend! Will this flyer just be front page, or front and back?